You cannot add "3 Day First Aid at Work Course - Saturday 16th of February 2019 09:45" to the basket because the product is out of stock. What is 3 Day First Aid Course ? How long is this First Aid course ? Our First Aid at Work course is 18 hours in total which usually spans over 3 days. However we try and offer at least one condensed First Aid at Work course per month. See our list of First Aid courses in London above. What will I be learning on this First Aid course ? Siren Training’s First Aid training comes with strong a reputation for practicality. We only use Emergency medical specialists to run our First Aid courses in London, or anywhere in the UK for that matter. We pride ourselves on the range of practical First Aid skills you learn when on one of our First Aid courses in London. We ensure you have all the help you need to complete your 25 multiple choice question paper at the end of the 3 days but our main focus is ensuring you are confident enough in your First Aid ability that if something had to happen and you were asked to put your skills to use you would have no hesitation, helping save someone’s life. Are you trying to find the perfect first aid course in London? Siren Training is the best company to contact. We are a dedicated training company that was set up by a group of Firefighters in 2013. Our team have a wealth of knowledge and experience in First Aid and Fire Safety. We deliver interesting, enjoyable, lifesaving skills to all sectors and industries. Here at Siren Training, weunderstand that First Aid is a practical subject and is best taught by professional trainers with real life experience. We have recognised how important first aid training is, which is why we are incredibly dedicated to providing the very best training we can. We have a team of over 70 instructors with various backgrounds including: Paramedics, NHS staff and the Armed Forces. They operate all over the UK and Ireland carrying out the best first aid courses in London and beyond. All our instructors hold the same passion and drive to share their valuable skills with everyone, so you know they are the best people to carry out the best first aid course in London and other regions. We only employ highly qualified and experienced instructors who make it easy for you to learn your new skills in an interesting and exciting learning environment. Here at Siren Training, we believe everyone should have the skills and confidence to act in an emergency, which is why we carry out the best first aid training possible. Every first aid course we carry out in London is there to help you feel more confident in life threatening situations. Therefore, you will feel more prepared if you ever find yourself in a situation that requires immediate first aid. In our first aid course in London, you will be equipped with the knowledge and skills to administer a wide variety of first aid techniques in the workplace with confidence – from treating minor wounds to saving the lives of colleagues in life-threatening situations. One first aid course we offer in London is the 3 day First Aid at Work course. This is our most advanced first aid course in London and provides you with a comprehensive set of skills needed by any first aider at work. Taught over 3 days, this first aid course in London is perfect for individuals who work in “high-risk environments”. Some of the industries where you are faced with these environments include: construction, manufacturing, sport, railroad, warehousing, hospitality, etc. After successful completion, you are provided with a certificate which is valid for 3 years which complies with the Health and safety at work act 1974. So are you interested in our first aid course in London? Feel free to contact Siren Training today. Either give us a call on 0203 740 8088 or fill in our contact form on our website. 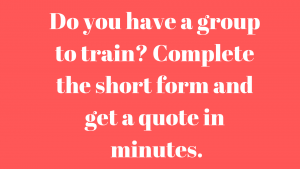 Fill in all the relevant information and one of our team will get back to you as soon as possible to discuss our first aid course in London.